This is a potent charas strain from the mountains of Western Nepal, now used to produce hashish through both the hand-rubbing and sieving methods. 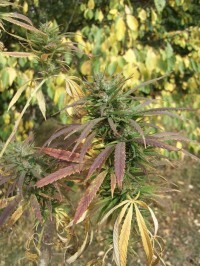 Cultivated at altitudes between about 1000m-3000m, there are two main phenotypes to be found in this strain: one between about 1.5m - 2m, and another closer to 3m. The compact phenotype has short internodes and tight bud formation. This Nepalese variety has great breeding potential for both tropical and northern growers, with excellent resistance to mold and cold, as well as highly refined resins and superb potency.